Take thick yarns, and thin yarns…some textured yarns, and fluffy yarns…some thin yarns, and some matching yarns…plus lots of unusual, fringed or glittery yarns…and think about some of the different ways you could best combine them all together into a single, cohesive piece. 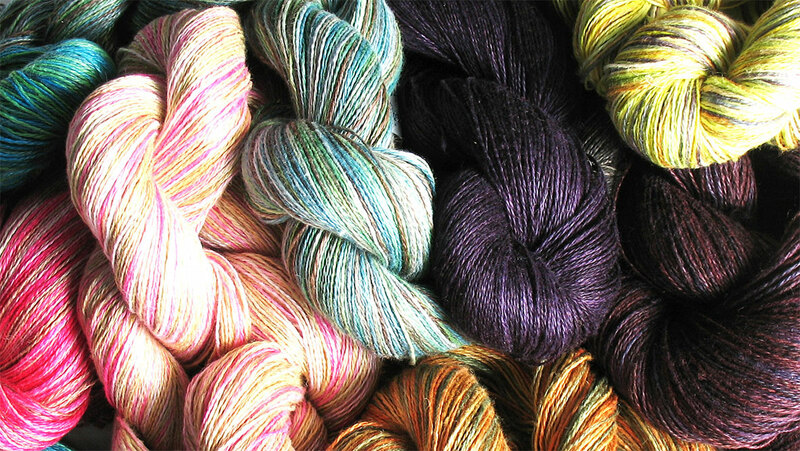 Perhaps this will involve separating your collected yarns into a couple of different, more colour coordinated groupings…or making sure that the clashing or much lighter or darker colours are kept to a minimum, to be used discretely and only very occasionally. Maybe some of the very thin yarns could be doubled up, or added to the surface of the more sturdy pieces. The thicker yarns might best be worked at a much looser tension to normal; or in a very lacy manner, leaving lots of intentional (and even unintentional) holes. For more yarn inspiration, see Prudence’s yarn photo gallery. To see how you could combine both knitting and crochet together to create small freeform patches, visit the freeform page. To see how Prudence eventually uses all of her freeform patches, take a trip through the various galleries. Prudence has always ‘collected’ interesting yarn. What started out as an obsession for seeking out distant yarn stores on her travels, and picking up the occasional odd ball of ‘something interesting’ here and there, has now turned into importing many of the more unusual yarns that don’t normally get into the shops in Australia…and even though she’d love to keep the lot in her own personal stash, she now also sells at least some of her interesting finds at various craft events around Australia and New Zealand, and occasionally also in her Etsy and Craftumi on-line shops.